Couched in the language of global warming and environmentalism is a plan for mass wealth redistribution from Whites to nonwhites. The GND is essentially a national version of the Paris Climate Accord, which dictated that wealthy White countries (especially the U.S.) pay for the development of nonwhite countries as reparations for allegedly ruining the climate through industrialization. The GND would use the pretense of global warming to redistribute wealth from Whites to nonwhites within America. One of its main stated goals is to “promote justice and equity by stopping current, preventing future, and repairing historic oppression to frontline and vulnerable communities.” The resolution later defines “frontline and vulnerable communities” as, in essence, nonwhites. The resolution posits that they have received the brunt of the negative effects of industrialization, and thus should be given reparations. This is representative of the broader anti-White ideology, which sees White success as always coming at the expense of nonwhites. Global warming is racist, and it is the government’s job to mitigate those effects. Whitey got a New Deal, and now we want ours. However, one goal of the resolution is actually an admirable one: to invest in modernizing the infrastructure of the country. More of an afterthought in the GND, this aspect would be at the forefront of a good version of this legislation in a White country. High-speed rail, the restructuring of cities to make them cleaner, more efficient, more beautiful, and more enjoyable, creating jobs through grand building projects, and improving the environment in tangible ways—these are the things we should be focusing on. Unfortunately, even the GND’s good ideas would largely be a failure in modern America. A socialist proposal like this combined with multiculturalism and open borders would still lead to catastrophe. For example, the resolution includes a federal jobs guarantee. Alexandria Ocasio-Cortez, one of the resolution’s chief architects, said this week that all Latinos have a racial right to come to the United States, legally or illegally. That means a guaranteed job for millions of people south of the border. Many Democrats believe the same right exists for everyone on earth (or at least everyone who isn’t White). In fact, the access of non-citizens to American constitutional rights has been affirmed by the U.S. court system. This means that any socialist program implemented in America must necessarily be extended to anyone who wants to come here and use it. This is the reason that every social institution in America is a failure. Socialism and mass migration/multiculturalism are incompatible. Socialism only works when combined with nationalism. Socialism presupposes a people. Without a cohesive nation to aid and improve, it just amounts to throwing money at various interest groups. The GND is not about pooling resources for the greater good of the nation, but redistributing them from one group to others. Any socialist project in America will be anti-White, because it will require Whites to give up resources in order to improve the lot of nonwhites. This is the primary reason for the visceral negative reaction of White America to socialist programs. Whites instinctually know that socialism means taking from them and giving to the outgroup. Conservatives capitalize on this instinct by feeding Whites the doctrine of individualism. The only alternative, they are told, to giving resources away to nonwhites is to avoid working for any greater good entirely. The Green New Deal would be a failure, but not for the reasons stated by conservatives. Their hand-wringing about the finances of it and scoffing at the utopian goals says more about them than it does about Ocasio-Cortez. Conservatives become obsessed with “paying for” projects as soon as those projects stand to benefit anyone outside of the special interests that control them. When it comes to tax cuts for the wealthy or importing more low-skilled labor for big corporations, no expense is spared, including the economic and demographic displacement of average Americans. When it comes to protecting the interests of Israel, no expense is spared, including the lives of Americans. When it comes to investing in America’s infrastructure and its future, all of sudden conservatives start crunching the numbers. This is because conservatives have no vision for the future themselves. 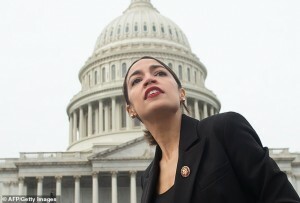 Ultimately, the path Ocasio-Cortez and others imagine will be a disaster for White Americans, but so will the status quo that conservatives so vigorously defend. In place of the Left’s vision for the future, conservatives provide precisely nothing. They fail to even mention the racial element of the GND at all, even though that is its primary element. As the representatives of nonwhite America fight tooth and nail for resources and a better future, White Americans are told that fighting for themselves as a group is immoral and that it’s silly and wasteful to dream of a better tomorrow. The representatives of nonwhite America are working to deliver a Brown New Deal to their people. White America’s representatives are leaving them to fend for themselves.